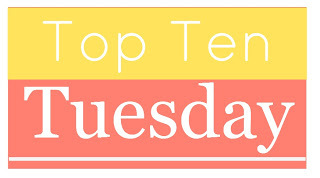 Top Ten Tuesday is a meme created by the lovly ladies at The Broke and the Bookish. Genres, conventions, tropes are all a part of writing but can also make reading feel stale sometimes. But that doesn't always have to be true. There are always those who can take the contraints and make it their own. I read a lot of books. A LOT of books. This week I am looks at some that didn't remind me of anything else, stood apart for some reason, and just managed to be unique. The story isn't all that unique but the way in which it is told is. There whole book is intended to be a dossier. There are reports, message conversations, recordings, pictures, diagrams, diary entires, and smooshed together like a mosaic to create a larger picture. I really enjoyed it. What I loved about this book was the fact that not once while reading it did I think of another book. It didn't remind me of anything. There were some faminiar elements but the writing and the mood and the characters all seemed so specific to this story that I never associated them with any other. Also, the writing was just beautiful. Is it me or is the UK cover better that the US one? I finished this on Sunday and it is already on this list. It was gorgeously written. It felt a bit like a fairy tale but not like a fairy tale that you have ever heard before. It was almost like a fairy tale from a fantasy world. I need the second book. Like NOW. What do you even say about this book. At one point there is a sentient shade of the color blue, towels are important, and the earth gets blown up due to space burpcracy. I spent the whole book whipping between, "What the hell? ", laughter, and wincing at things being a bit too close to home. This is the concept novel at it's very best. The book apparently is a library book so it contains on fairly straightforward book but in the margins there are the notes back and forth from two different people who are trying to solve a mystery. Basically, this book is cooler than me. Seriously, what the hell is this book? I don't even know. Stuff happened and I cared but I didn't understand it. Just thinking about it makes me dizzy. This is the book equivalent of a head injury. The story is nothing special. A guy and a girl go to collage and meet one another. The unique thing about this book is the fact that the story is told from everyone else's point of view. Everyone is shipping them. Even the bench they sit on and the squirrel. You know what is going to happen but the entertainment in this case is all in the telling. It has been eight years since I read this book. I still think about it. A lot. The main character is unnamed, morally reprehensible (but somehow I liked him), and just in a horrific accident where most of his body is severely burned. And then things start getting weird. I really should reread this and do a full review. I talk about it enough. I was torn between pretty much every magical realism book that I have ever read. Because if there are rules them these books throw them away. I am very hit of miss with the genre. It has to hit me just right or I end up hating it. This book is an exception because it had me hooked even when I could still see flaws. Rating: Ew. I can't look away. Someone recommended these books to me as feminist fantasy. I don't know if it is. But I haven't read something that reminds me of it before or since. It is not for you if you mind violence, abuse, or disturbing content.